The original idea of the elements has been evolving. We have explored and exploited the earth to its limits; nothing is left untouched. We have moved away from the original, pure conceptions of water, air, energy, and earth. Now we see them all as just materials to be consumed. Arunkumar H G has long been active both as an artist and as an ecological activist. The catastrophic depletion of the earth’s water resources lies at the centre of his preoccupations. His assemblage, ‘Hollow Drop’, articulates this ecological crisis through the medium of a plastic tapestry. Woven from bottle caps collected from a particular neighbourhood over a period of time, this work testifies to the degradation of natural sources of water, such as rivers and lakes, and our corresponding dependence on artificial, indeed industrial processes of water purification and distribution. ‘Hollow Drop’ is a critique of humankind’s irresponsible behavior towards its planetary habitat. 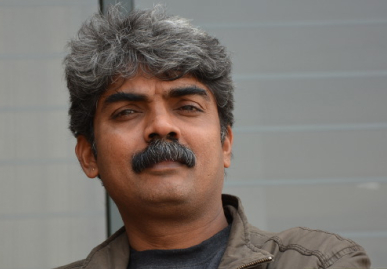 Arunkumar H G (born 1968) has held several solo exhibitions of his work, including Inflatable Works (Nature Morte, New Delhi, 2001), FEED (Nature Morte, New Delhi, and Sakshi Gallery, Mumbai, 2006), TRACT (Nature Morte, New Delhi, 2010) and Seed of Reckoning (Mumbai Art Room, Mumbai, 2012). He has participated in numerous curated exhibitions, among them Zip Files (curated by Ranjit Hoskote, foundation b&g and Religare, New Delhi, 2009), Zones of Contact (curated by Deeksha Nath, Akanksha Rastogi and Vidya Shivadas, Kiran Nadar Museum of Art, New Delhi, 2013) and Citizen Artist (curated by Geeta Kapur, Chemould Prescott Road, Mumbai, 2013). His practice explores expanded definitions of sculpture in interactive and public contexts.